Back in the 1970's through the early 1990's euro cars from the motherland were often fitted with more powerful engines than their USA exports. Euro 1982-1984 Porsche 928S's were conservatively rated at 310hp (published reports were more like 330hp) versus 240 hp engine for the USA spec engine. The most obvious way to spot a euro 928 is to look for the rear mounted fog light to the left of the license plate. The 928 engine has the distinction of having the longest timing belt fitted on any car production engine. 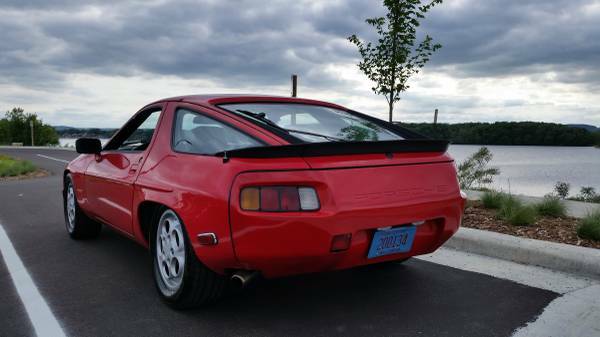 Find this 1984 Porsche 928S for sale in La Crosse, MN for $10,500 via craigslist. Tip from MB. 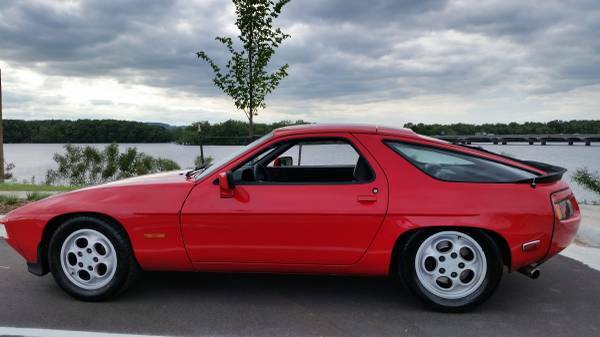 Very rare 1984 Porsche 928 S2 Euro model with 310 hp twin distributor engine. This is a true Euro with the ZZZ vin #. It has the original numbers matching engine and transmission in it. It has the 4 speed automatic transmission. Has 3 inch stainless exhaust system from the cat back. (Sounds Amazing) It is a little loud due to the fact that it has the rear muffler delete. This is a very strong running car! There is said to be only 300 Euro model 928's for 1984. The car was equipped originally with the 16 inch phone dial wheels. They were still an option on Euro Cars in 1984. The car will be on the 16-inch phone dial wheels for my asking price. It is a sunroof delete model which is rather rare as well. This is also one of the very first 928s with ABS brakes. The car is in good condition for its age. It has been painted sometime in the early 90s. (still looks good but it's starting to show its age in a few spots) The car was originally a gray / pewter color. The interior is the original black leather interior and it does have cracks in the front seats and a few in the dash. Other than that the interior is pretty clean. The car has working AC and the HVAC system works as it should. This is a very complete car with the original spare, jack, and tool kit! This one had a major service done summer of 2016. The timing belt, cam seals, spark plugs, all fluids, alternator, and some other things I'm forgetting. I have well over $10,000 in receipts for this car. I prefer to sell this car to someone who knows what they are looking at here. This is not the cheap Porsche. This was sold on the dealer floor in 1984 for more than the the 911. It was almost $50,000 new. The Porsche 928 has been the star in many 80s movies. The odometer stopped working at 82k around 5 years ago. And the power steering line has a leak in it right next to the pump, therefore the power steering will not work unless you top it off with fluid regularly. The few negatives to this car are why it is being discounted to the price it is listed at. If it was 100% perfect with full documentation I would be asking its Book price of $18,200. I own a Porsche 911 SC, a BMW E28 M5, and a few other classic cars as well (Not for sale sorry). This car has been well cared for by me and the previous owner. I have always Run Mobil 15w 40 full synthetic oil and Mann filters. I'm not hurting for cash therefore I will not respond to low-ball offers. If you're prepared to buy and interested in looking at the car please feel free to give me a call or text. No spam messages will be answered nor will emails. First $ 10,500 cash takes it! 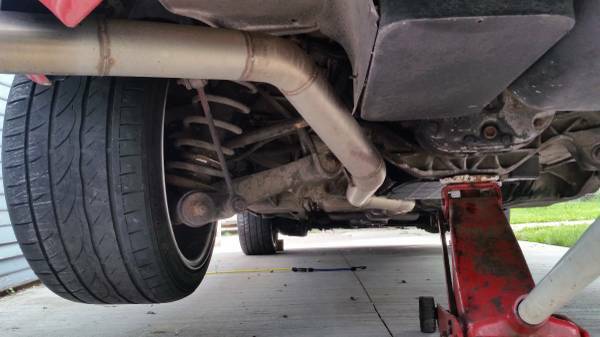 The biggest negative I see in looking this over is that the seller didn't post a sound clip of this exhaust set up. It must be quite loud and rowdy. Rear muffler delete pipes are very common mod on 928's, but this car does not look to have any sort of resonator after the cat- if it even has a cat. The odometer issue can easily be fixed by many speedo repair shops who sell replacement the plastic gears. Here's the actual listing. Let me know if anyone wants a local look at it...I'm free this weekend for a road trip! The most controversial car Porsche has ever built/sold, especially with an Auto tranni. You either love it or NOT. Technically this should have been a world beater, this is just one example that not every model will get accepted. Always liked the Italian Camaro! In Detroit, we called 928s a rich man's Pacer. Or was it the Pacer that was the poor man's 928...? Those side markers are definitely an afterthought, probably to pass a US state inspection. The US spec cars have them, but are flush with the body. I see now. They were added when car was federalized, and even though current seller did major bodywork on passenger side, he elected to keep them on as deleting the other side would have been costly. It's a Euro. For our fastest lemons build we built up a Euro motor with twin dizzy, dropped it in the 928 estate, and reved it to 6200 before upshift. That was a gazelle. After it blew up (yeah) we took the go-fast euro parts off and have put them in 2 bottom ends since. Not as fast as the original but fun still.